It was Brad Gilbert, the American tennis coach that counts Andre Agassi and Andy Murray among his former clients, who coined the phrase ‘winning ugly’. At least, he is the man who wrote a book on the subject such was his fascination with mental grit. However, the concept of grinding out a result can be applied anywhere. A well-worn theory suggests it takes 10,000 hours practice of any given skill to make it perfect. To me, the most pertinent lesson to take there is that the vast majority of time things are not going to go precisely to plan. Indeed, adaptability and opportunism are pivotally important tools for sporting success. And rugby is no different. In fact, the disruptive weather conditions of a northern hemisphere winter – always cold, often wet – place heightened emphasis on these inherent qualities. Scarlets’ European Champions Cup tie at home to Leicester Tigers on Saturday evening provided a perfect platform to prove such a theory. In a rather clunky encounter, neither protagonist managed to click into gear. There were 33 turnovers conceded between the sides and 58 kicks from hand. As the statistics hint it became a grim exercise in preying on one another’s errors. But sometimes it goes like that. The transition between defence and attack is the most fertile source of tries in the modern game. Tackle rates rarely drop below 85 per cent, so the best time to take advantage is before the opposition can organise themselves after losing possession. Question: how many of New Zealand’s tries come from devastating counter-punches, lacerating a broken field on the back of a robust tackle or stealthy pilfer? Answer: a huge amount. The standard at Parc Y Scarlets this weekend was significantly lower than during most All Blacks Test matches, but the hosts prevailed 15-3 thanks to similar principles. The tries that split the teams both came about from Leicester mistakes. Still, there were impressive fundamentals in play. Two instances of unglamorous graft manufactured scoring opportunities from nothing. Of course, Miles Benjamin’s fumble is a shocker. He is a far better player than that, and will come back strong. What we are focussing on, with help of the below screenshot, is the selfless work that allows Robinson to pounce. Before anything else, the weight on Rhys Priestland’s kick is excellent – into the corner but not over the touchline, forcing Tigers to field the ball and make a decision. Crucially, Robinson remains behind the kicker before launching forward charging off in pursuit. Next, look how Priestland and Robinson keep their discipline. They stay in line and press as a pair at the same pace. If one of them had shot up without the other in a ‘dog-leg’ shape, they would have been far easier to beat. 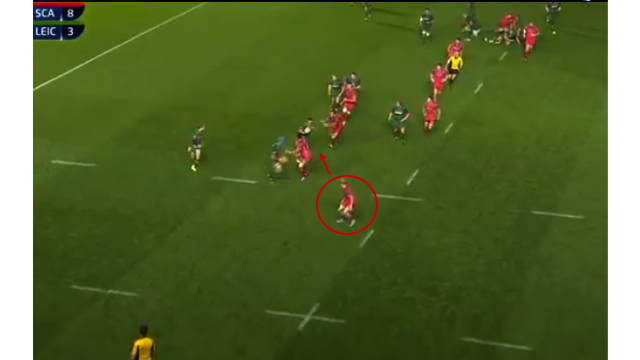 As it was, Priestland and Robinson close the space brilliantly and can pounce. The former’s skilful flick pass from the deck is worth another watch. Scarlets’ second, snared by Aled Davies on the hour mark, was forged from more spoiling. Tigers chased from 8-3 behind, attacking from their own half, and some determined individual scramble defence – not to mention a decent dose of luck – fashions an opening. This sequence actually begins with neat structure from Leicester. 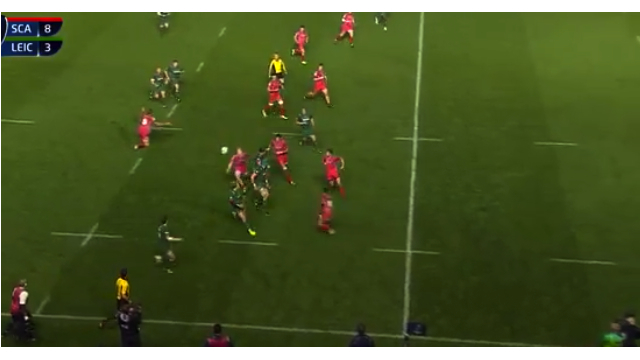 Identifying weight of numbers out wide, Ben Youngs organises a pod of forwards to execute a wrap-around that fixes the primary wave of defenders to create space on the flank. 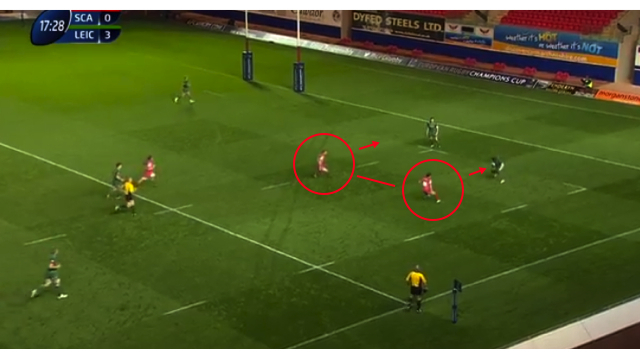 Note that Davies (circled in red) has filled in out wide, hanging deep to cover a kick. Fortune favours the brave. Under pressure, Youngs’ pass goes astray and Davies is first to react. He picks the pocket of his opposite number and can skate home. This final screenshot, of wing Kristian Phillips sprinting in support of Davies, may not seem overly significant. I beg to differ. In my opinion, it demonstrates togetherness and industry. With those traits, the bounce of the ball is more likely to go your way. The Scarlets made their own luck for a famous European win. It was not pretty, but they definitely do not care. Is “winning ugly” part of what makes good teams great? How do you re-create turn over conditions at training, where defences are broken and players should play “off the cuff” rugby?